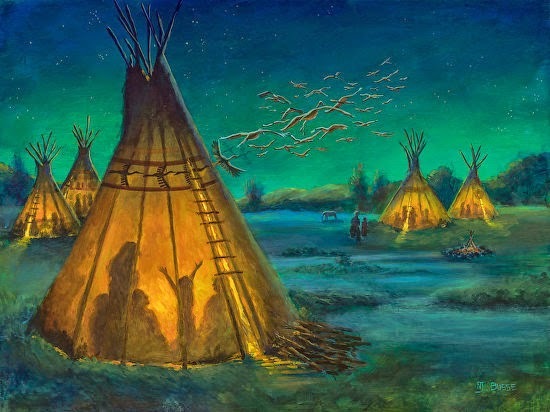 In this painting there are 2 storytellers: the me-the-artist and the child in the glowing teepee. Both of us are spinning yarns. The child brings the sandhill cranes to life with the enthusiasm of her tall tale. I'm telling a tall tale about the power and magic of imagination and the spoken word. I had a story I wanted to tell with this painting. I remember how I loved stories as a child, listening to them and telling them. BIG stories with fantastic elements and plenty of fabrication! 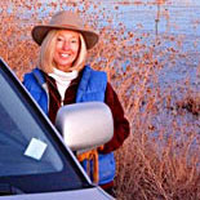 In The Storyteller, the power of a young child's spoken words bring the sandhill cranes to life. They exist first on the teepee as a graphic element and then burst into the starry night sky, real and full of life!